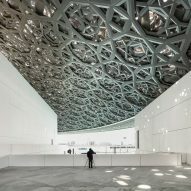 These photographs by Luc Boegly and Sergio Grazia show the complex engineering of the vast dome that is suspended over the galleries of Jean Nouvel's Louvre Abu Dhabi in the United Arab Emirates. 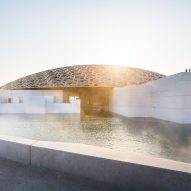 Meetings between the French architect and engineers Buro Happold began in 2007, with the architect laying out his vision for an art gallery like nothing the world had seen before. 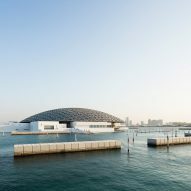 Nouvel wanted to create a cluster of buildings arranged like a traditional Middle Eastern souk out in the water of the Persian Gulf, under a dome that would appear to float above it. "He tends to start with words, he writes a paragraph or two about a project before he even sketches something," Andy Pottinger, Buro Happold's associate director and lead structural engineer on the project told Dezeen. "Often as engineers we chuckle when we're asked to make things float," he said. "But in this case we took it very, very seriously, and really tried hard to make it look like something that's just nestled down on the top of the buildings." 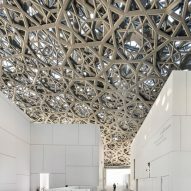 Another core part of the Nouvel's vision was a "rain of light" from the sun that would filter through the dome onto the plazas and galleries below. "The light was like a material for us that we had to facilitate," explained Pottinger. 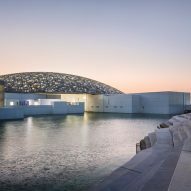 To add to the challenge, the architect wanted no visible lines of strength for the dome of the gallery on Abu Dhabi's Saadiyat Island. For Buro Happold, which typically works on stadium projects such as the Etihad Stadium expansion or the Bristol Arena, this meant putting much of their usual design programming to one side. Instead the engineering team began exhaustive rounds of digital modelling, trying to devise a dome that could deliver Nouvel's dream. 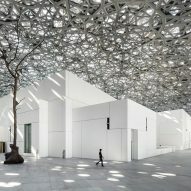 Unlike a "true" dome, the Louvre Abu Dhabi dome does not push down around its circumference, but rests on just four supports. "The supports are about 110-metres apart and they form a square below the circle of the dome when you look at it on plan. That was vital because that brought symmetry into the equation," said Pottinger. "At first, to be honest, much of what we were doing wasn't successful. We would create geodesic type approaches, with triangles forming the dome, or orthogonal approaches, where you had a square grid," he added. 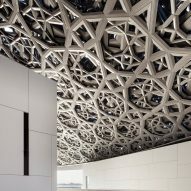 "None of that was working, it was clashing with the base pattern that Jean Nouvel had wanted to express." The breakthrough came with the 23rd model, where the team started again with a blank slate and drew that base pattern on the dome as a starting point, adding only what was completely necessary. The result was the layers of steel cladding that tessellate out, with no straight line longer than 10 metres anywhere in the design. 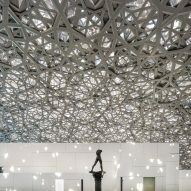 Iterations of the pattern could also achieve Nouvel's lighting vision by altering the layering of the pattern at different points in the dome. "The architect would talk to us about what sort of light they would like on the plaza or above the galleries and give us maps of luminance," explained Pottinger. 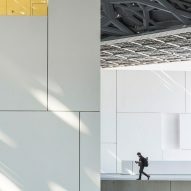 "We would run with those and we'd apply it to our software and adjust the thickness of the cladding or the size of the cladding to create the right porosity." 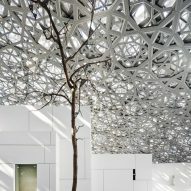 The dome design cracked, the engineering team had to contend with the extreme environmental demands of building a gallery on the man-made Saadiyat Island, with a hot desert climate and in an earthquake zone. 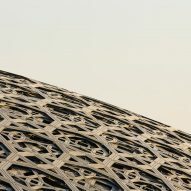 To earthquake-proof the dome, each of the four supports have curved surface spherical bearings that allow the structure to shift beneath the dome as the earth shakes whilst the isolated structure remains still. The sliding bearings also allow the dome's steelwork to tolerate the shift in temperature from hot days under the desert sun to cooler nights. "What they also do is they allow the dome to breath in and out, as we call it," said Pottinger. "Temperature forces are almost impossible to resist, but what these sliding bearings allow it to do is to expand out by about 180 millimetres during the day and then to shrink back in overnight." Rather than fight the climate and geography, Pottinger and his team embraced it. "I've gone along the lines of it being about the elements, the earth, the sun, and the sea," he said. Few structures in the world are built out on to the water on reclaimed land, and even fewer hold priceless collections of art. To incorporate water into the design, Buro Happald looked to places such as Venice for inspiration. "In an ideal world as engineers we would want to keep the perimeter of the building as simple as possible because it makes things less complicated to design in the case of things like shrinkage and the cracking that that leads to that might lead to a water ingress," he explained. 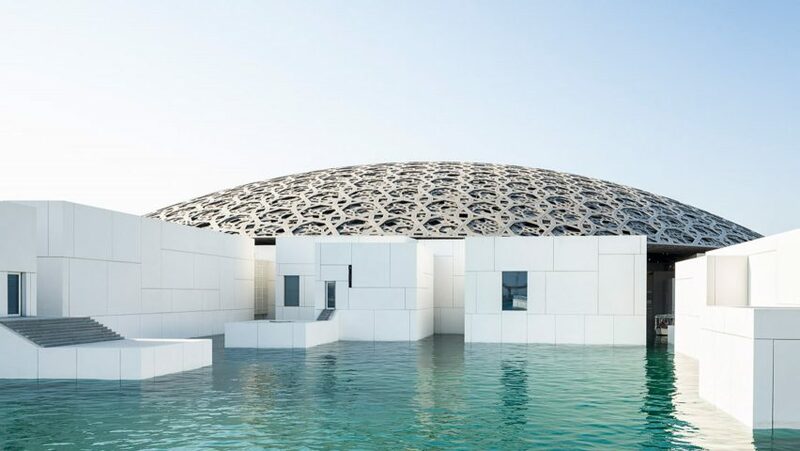 "But again, we had to embrace the fact that Jean Nouvel wanted it to be like an Arab souk in the water, and that means the water has to come in." The architect's vision met, the engineering team's final challenge was to consult on the security measures required for a building that houses both permanent art collections and receives highly valuable works from around the world. The security measures are shrouded in secrecy, but Pottinger revealed that art is brought into the building through a system of tunnels. Despite so many seemingly conflicting demands on the engineering team, Pottinger retained a clear sight of achieving a finished structure true to Nouvel's original vision. "One of the absolutely overriding things we had to do was to find simplicity amongst the complexity. If we didn't do that it wouldn't be buildable," he said. "So many projects in this day and age actually get quite dumbed down in the latter stages." A timelapse video shows the eight-year construction process behind the gallery, which opened to the public in November 2017. Photography is by Luc Boegly and Sergio Grazia.